Branston is a British food brand best known for the original Branston Pickle, a jarred pickled chutney first made in 1922 in the village of Branston near Burton upon Trent, Staffordshire by Crosse & Blackwell. However, the Branston factory proved to be uneconomical, and production was moved to Crosse & Blackwell subsidiary, E Lazenby & Sons in Bermondsey, London, where it invested in new buildings in 1924 and 1926, which remained in use until 1969. In 2004, the pickle business was sold by Nestlé to Premier Foods and production was moved to Bury St Edmunds in Suffolk. Premier Foods sold the brand to Mizkan in 2013, at which time it ceased to be labelled as Crosse and Blackwell because in Europe this name was sold separately to Princes Group. The pickle product sells over 17 million jars a year in the UK. Branston Pickle is made from a variety of diced vegetables, including swede (rutabaga), carrots, onions and cauliflower pickled in a sauce made from vinegar, tomato, apple and spices. In recent years high-fructose corn syrup has replaced sugar in the product sold in the American market. Sugar is still used in the British version. Branston Pickle is sweet and spicy with a chutney-like consistency, containing chunks of vegetables in a thick brown sticky sauce. It is commonly served as part of a ploughman's lunch, a popular menu item in British pubs. It is also frequently combined with cheddar cheese in sandwiches, and many sandwich shops in the UK offer cheese and pickle as an option. It is available in the standard 'chunky' version, as well as a 'small chunk' variety, which is easier to spread onto bread. Convenient squeeze-bottle packs are also in the range, along with a 'smooth' recipe. Branston also has flavoured pickles including Sweet Chilli and Beetroot flavoured pickle. Additional Branston products include mayonnaise, tomato ketchup, brown sauce, salad cream, and baked beans. In October 2005, Premier Foods launched Branston Baked Beans. The marketing and promotion of this product was aimed at challenging Heinz's dominance of the UK baked bean market. This marketing included an advert, featuring a Branston Bean Tin explaining how Branston Beans are very "saucy". Promotional activities included a 'Great British Bean Poll' where members of the public across the country were invited to blind taste both 'the brand leader' (assumed to be Heinz) and Branston. In the poll, 76% of participants picked Branston over the brand leader. Heinz elected to change their recipe in the face of this aggressive activity. Premier Foods also attempted to leverage the traditional Branston Pickle brand name by producing Branston Relishes in four different flavours: Hot Chilli & Jalapeño, Gherkin, Sweet Onion and Tomato & Red Pepper. Around November 2015, a sweet chili-flavoured pickle was launched, and the brand's rich and fruity sauce was re-launched, along with two new sauce flavours, rich and spicy and rich and smoky. In 2017, Branston launched its tomato ketchup, mayonnaise and brown sauce lines in single-serving sachet packaging. Walkers once produced a variety of crisps called "Cheese and Branston Pickle". In late 2012, it was announced that as part of an aggressive debt reduction strategy, Premier Foods would be selling the Branston brand to Japanese food manufacturer Mizkan Group for £92.5m, joining Sarson's vinegar and Hayward's pickled onions as recent Premier Foods to Mizkan brand acquisitions. The Bury St Edmunds plant continues to manufacture Branston products. Branston Pickle is sold in Ireland, the United States, Canada, Australia, New Zealand, Norway, France, Denmark, Malta, Singapore (Cold Storage and Market Place), Germany (REWE and Globus Warenhaus), Turkey (Tesco Kipa), the Netherlands, the Czech Republic, Slovakia (Tesco), Belgium (Carrefour Market Etterbeek), Hong Kong (Taste), South Africa, southern Spain (Supersol and Carrefour), Thailand (Chiang Mai, Rimping), Vietnam, Angola and Namibia. ^ a b Ruddick, Graham (30 October 2012). "Branston Pickle sold to Japan's Mizkan in £92.5m deal". The Telegraph. Retrieved 26 October 2017. ^ Bourke, Joanna (6 December 2016). "London Square buys former Branston pickle Bermondsey site for flats". Evening Standard. Retrieved 27 October 2017. ^ "Crosse and Blackwell / E Lazenby & Sons". Exploring Southwark. Retrieved 12 September 2017. ^ Owen, R.; Dynes, M. (1992). Tuttle guide to the single European market: a comprehensive handbook. C.E. Tuttle. p. 163. ISBN 978-0-8048-1815-5. Retrieved 27 October 2017. ^ "Pickle 'demand rises' after fire". BBC NEWS. 2 November 2004. Retrieved 27 October 2017. ^ "Branston sold by Premier Foods". BBC News. 30 October 2012. Retrieved 27 October 2017. ^ a b c Martin, K. (2017). Famous Brand Names and Their Origins. Pen & Sword Books Limited. pp. 8–9. ISBN 978-1-78159-015-7. Retrieved 27 October 2017. ^ Victor, Anucyia (5 January 2016). "Sugar Smart app exposes how much sugar your favourite food contains". Daily Mail. Retrieved 27 October 2017. ^ "What is Branston Pickle? (with picture)". Wisegeek.com. 30 January 2014. Retrieved 20 February 2014. ^ a b Kazmier, Penny (26 January 2016). "In the U.K., the Branston Pickle adds crunchy, savory kick to sandwiches". Daily Herald. Retrieved 27 October 2017. ^ a b "Branston launches new flavoured pickle and table sauces". FoodBev Media. 4 November 2015. Retrieved 27 October 2017. ^ Evans, Graeme (30 October 2012). 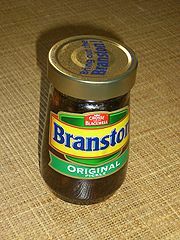 "The £90m pickle: Branston sold to Japan firm". The Independent. Retrieved 27 October 2017. ^ "Ketchup and brown sauce left on the shelf: Sales fall up to 7% as consumers favour spicier alternatives". Daily Mail. 16 September 2013. Retrieved 27 October 2017. ^ a b c Pringle, H. (2008). Brand Immortality: How Brands Can Live Long and Prosper. Gale virtual reference library. Kogan Page. p. 232. ISBN 978-0-7494-5572-9. Retrieved 27 October 2017. ^ Gill, Joe (21 February 2006). "Heinz to change baked beans recipe as it faces Branston challenge". Brandrepublic.com. Retrieved 18 March 2013. ^ Marketing. Haymarket Press. 2005. p. 10. Retrieved 27 October 2017. ^ Panthaki, Fabian (27 October 2017). "Mizkan Expands Foodservice Offers From Branston, Sarson's". KamCity. Retrieved 27 October 2017. ^ "Walkers Cheese and Branston Pickle Flavour Crisps". Taquitos.net. Retrieved 20 February 2014. ^ "BBC News - Branston sold by Premier Foods to Japan's Mizkan". Bbc.co.uk. 30 October 2012. Retrieved 20 February 2014. ^ Sifton, Sam (3 April 2017). "Recipes for a Better Week". The New York Times. Retrieved 26 October 2017. ^ Ruprecht, T. (2010). Toronto's Many Faces. Dundurn. p. 129. ISBN 978-1-4597-1805-0. Retrieved 26 October 2017. ^ Lichfield, J. (2012). Our Man in Paris: A Foreign Correspondent, France and the French. Signal Books. p. 23. ISBN 978-1-908493-56-9. Retrieved 26 October 2017. ^ Campbell, J. (2014). The Bookshop Book. Little, Brown Book Group. p. pt104. ISBN 978-1-4721-1670-3. Retrieved 26 October 2017. ^ Jacy Meyer, W.W.J.M. Prague In Your Pocket. In Your Pocket. p. 27. ISBN 978-0-01-213212-8. Retrieved 27 October 2017. ^ Dodd, J.; Lewis, M. (2003). Vietnam. Music rough guide. Rough Guides. p. 113. ISBN 978-1-84353-095-4. Retrieved 27 October 2017. ^ Stead, M.; Rorison, S. (2010). Angola. Bradt Guides. Bradt Travel Guides. p. 121. ISBN 978-1-84162-304-7. Retrieved 26 October 2017. Wikimedia Commons has media related to Branston Pickle. This page was last edited on 13 March 2019, at 17:15 (UTC).